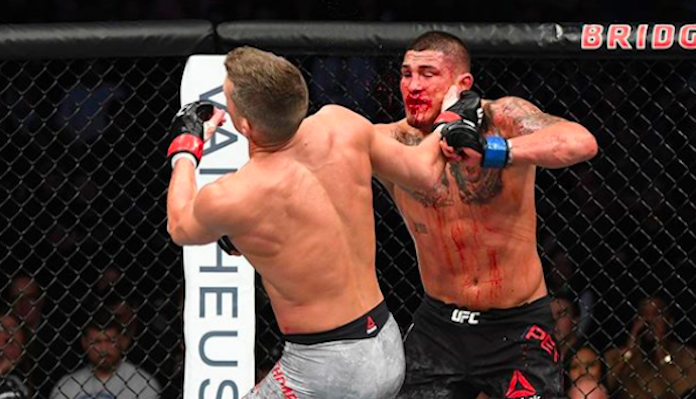 Home MMA News Anthony Pettis What’s next for UFC Nashville main and co-main event fighters? On Saturday night, the UFC returned to our screens with the exciting UFC Nashville card. In the co-main event, Curtis Blaydes and Justin Willis met to settle their differences inside the Octagon. Meanwhile, in the main event, Anthony Pettis moved up to welterweight to take on Stephen Thompson. Ultimately, Blaydes beat Willis by unanimous decision while Pettis knocked out Thompson in the second round. Here is what we think should be next for these four fighters after UFC Nashville. Anthony Pettis was moving up in weight to 170lbs to take on a former title challenger in Stephen Thompson. He said he wanted to try and solve the puzzle that is Wonderboy and ultimately did exactly that, becoming the first man to knock the South Carolina native out. He’s now likely to become a top-5 welterweight. Pettis now has quite a few options on the table. He can stay at welterweight or go back down to lightweight. If he stays at welterweight the fight he asked for against Rafael dos Anjos make plenty of sense, assuming dos Anjos beats Kevin Lee. If he returns to lightweight, fighting the winner of Edson Barboza vs Justin Gaethje also makes too much sense not to happen. Stephen Thompson was looking to get back into the win column when he took on Pettis. But, after a solid first round he got caught with just five seconds left in the second round. Now, a fight that makes sense is taking on Robbie Lawler, assuming Lawler doesn’t get a rematch against Ben Askren. Thompson has wanted this fight for some time now, and given they are both coming off losses, the time to do it is now. Curtis Blaydes did what he said he was going to do. The game plan was to outwrestle Justin Willis and he did exactly that. Now, a fight that makes sense for Blaydes is to take on Stipe Miocic. The former champion hasn’t fought since July because he wants a rematch against Daniel Cormier. But, a win over Blaydes would put him right back into title contention. On the other hand, a win for Blaydes could put him one win away from a title shot. Justin Willis got dominated. He had no answer for Blaydes’ wrestling and was taken down over and over again. Now, Willis will no doubt have to fight someone lower down in the rankings. One option is the loser of the upcoming fight between Shamil Abdurakhimov and Marcin Tybura. Who do you think should be next for these four fighters after UFC Nashville?